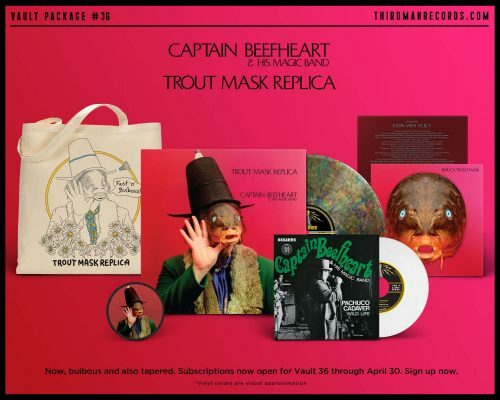 The remastered Trout Mask Replica is at last getting a vinyl release. It is in the capable hands of Jack White’s Third Man Records. Not only are they releasing the double vinyl album but also the mega-rare France-only single “Pachuco Cadaver / Wild Life”. Other bits and bobs are included in this package. Like all Third Man Records this will not be available in a store. You will have to sign up for a subscription on their website … and to get this Beefheart release (Vault Package #36) you’ll need to do it before 30 April 2018. The cost is $60 plus shipping. Once again nobody to do with the making of this record will get any money, so please DO NOT BUY THIS RECORD, (sorry about the shouting). As noted Robert Arthur Williams is in dire need of cash, so send some to him and/or John French, they need it more than you need this record. What about Dons wife Jan? SHE should be getting any royalties from this reissue! Not John or whoever. This is unreal. Not fair to Jan.
I’m sorry but I must disagree..I don’t know the exact ‘in’s and ‘out’s about who will or who will not, benefit from the release of this record.. There are a multitude of re-issues out there, but IF.. (and I say ‘If..”) it has been remastered, in a similar way to the ZFT CD release of TMR, which I never bought as I wanted to wait for the vinyl version, I am certainly interested to hear it. As I understand it, John ‘Drumbo’ has spoken to Ahmed at ZFT and it looks like this, or possibly ‘future’ releases under the ‘Beefheart’ banner may even be of benefit to those involved with the recordings in some way. Whether you believe the acquisition of the Beefheart name was to help Jan or to purely benefit ZFT, I am pretty sure Jan will receive something. I’m sorry but no-one is gonna tell me who and what I should spend my hard to come by cash on, or try to make me feel guilty. I’m pretty sure that Jan will be getting any dues for Don as songwriter from this and any other legit release. Of course Steve.. That was my point.. However we feel about those that worked incredibly hard on those albums not getting financially compensated. It is those actually ‘credited’ as songwriters that will receive royalties, that is and sadly has always been the way. My copy arrived today and is beautiful to behold. The quality of the sleeve is like no other edition of TMR that I’ve seen and the assorted TMR ephemera is equally lovingly created. Good to see Drumbo rightfully listed with the credits for the band on the inner sleeve too. It sounds fabulous, but then all editions of TMR that I have heard sound fabulous; I would never be able to tell them apart and don’t really see how the sound quality could be improved. In short: it sounds like Trout Mask Replica. Unless you have incredibly discerning ears, you probably don’t want to buy this edition just for the remaster but the lavish, immaculate packaging and the sheer joy of buying TMR *again* make it worthwhile. Thanks for the response. I was able to get a copy from “that auction site” for less than Third Man price. Yes, it sounds like TMR, beautiful! Nice clean vinyl. The package is indeed immaculate! It is the remastered version and the sound is excellent. Everything is just that bit more brighter and clearer plus there’s a bit more bass. Just got my package. Stoked! Be interesting to talk to the individual who thought Pachuco Cadaver was single material. It’s my personal favourite, but really, a single, even way back then? I know, it’s a great choice. Too bad it only happened in France. Personally I’d picked Ella Guru because it’s so giddy. I suppose China Pig would be the only track I couldn’t pick, because so atypical. Horribly disappointed in the vinyl quality. The “Sardine” colored vinyl had so many clicks and pops that my receiver shut itself down to avoid speaker damage! I know the Travers remix is great and hoping the 2019 RSD black vinyl release plays better.